Ice cream is a popular dessert. No doubt about that! It can be found everywhere, especially in the summer, whether at a 4th of July parade, the beach, or in your own backyard. Some of our past posts have featured ice cream recipes. But what about other things related to ice cream? How about ice cream freezers or ice cream containers? A search on the Collections Search Center turned up several catalogs relating to ice cream. One of these is the Catalogue and Price List of the Dayton Paper Novelty Co. 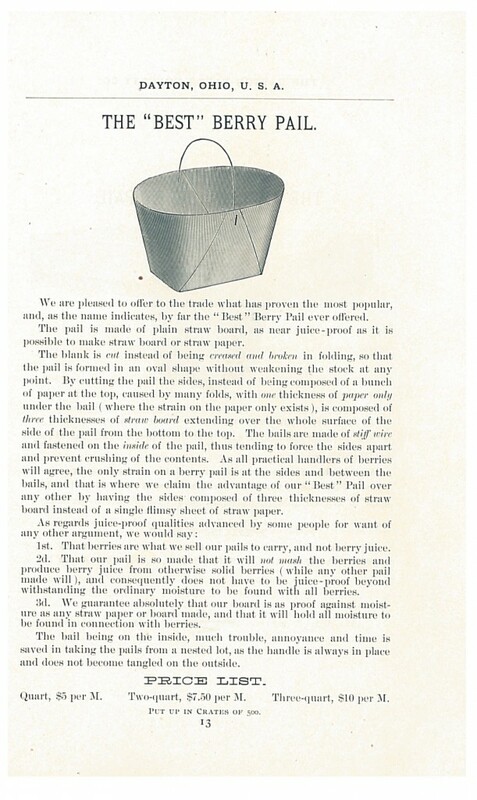 Dated 1888-1889, it is the company’s second general catalog. Dayton Paper Novelty Co., Dayton, OH. 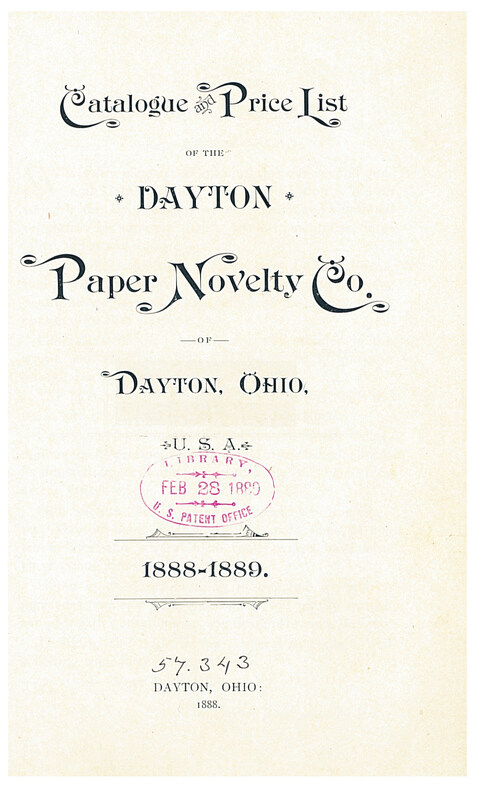 Catalogue and Price List of the Dayton Paper Novelty Co., 1888-1889, title page of catalog. Dayton Paper Novelty Co. manufactured paper containers for many different uses. 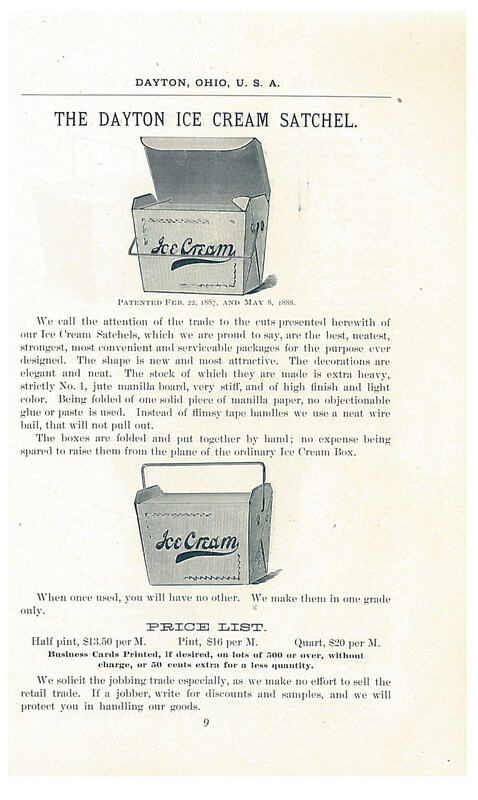 One of their products was the Dayton Ice Cream Satchel. To construct it, they used one solid piece of extra heavy and very stiff light-colored manilla board and folded it by hand. Because it was made entirely by folding one piece of board into place, no glue or paste was needed. That also meant no glue finding its way into your ice cream! And no flimsy handles either. The handles were made of wire that would “not pull out.” The containers were available in three different sizes–half pint, pint, and quart–with the option of printing a business card onto the boxes. Catalogue and Price List of the Dayton Paper Novelty Co. is located in the Trade Literature Collection at the National Museum of American History Library. Want more ice cream? 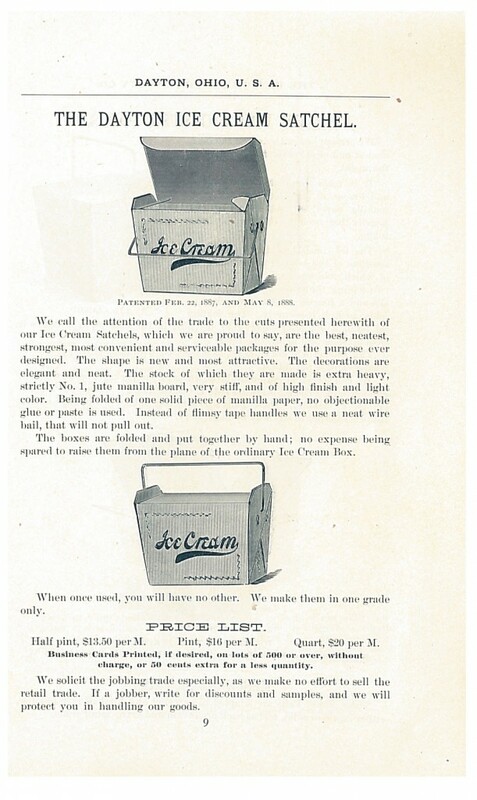 Take a look at some ice cream recipes from 1907 here and here or a post about a mystery ice cream mold!